Q: Late last night Beijing time, the White House said in its statement that the United States will impose a 25% tariff on $50 billion of goods imported from China containing "industrially significant technology", and will later announce specific investment restrictions and enhanced export controls for Chinese persons and entities related to the acquisition of industrially significant technology. Moreover, it will continue to pursue litigation against China at the World Trade Organization in relation to intellectual property rights. The Chinese Commerce Ministry has given its response to this. Do you have any update on it? Could you tell us the specific countermeasures China plans to take? As US Secretary of Commerce Wilbur Ross will shortly be in Beijing for a new round of trade negotiations, will this statement by the White House affect the upcoming negotiation? Is China going to cancel his visit? A: Just like what you said, the spokesperson of the Ministry of Commerce already responded to this last night. I believe that we all share the same feeling that when it comes to international relations, each and every flip-flop will only lead to further depletion and squandering of a country's credibility and reputation. The US' statement explicitly runs against the consensus it reached with the Chinese side in Washington D.C. not long ago. We urge the US to honor its words and meet China halfway in the spirit of our joint statement. China always maintains that we should properly resolve and address relevant differences over economic and trade issues through equal-footed dialogue and consultations in a constructive manner. This serves the fundamental and long-term interests of our two countries and peoples, and meets the shared aspirations of the international community. Once again, we don't want a trade war, but will never quail or recoil from a trade war. One move can always be countered by another. If the US is bent on having its own way, we will surely take firm and forceful measures to safeguard our legitimate rights and interests. As for whether China will take specific countermeasures and the US Secretary of Commerce Ross's scheduled visit to China for a new round of trade talks, I would like to refer you to the Commerce Ministry. Q: State Councilor and Foreign Minister Wang Yi will visit South Africa and attend the Formal Meeting of the BRICS Ministers of Foreign Affairs. Does this aim to lay the groundwork for President Xi Jinping's attendance at this year's BRICS Summit? A: This year marks the 20th anniversary of the establishment of diplomatic ties between China and South Africa. During the past two decades, thanks to the concerted efforts of the two sides, China-South Africa relations have been growing in a comprehensive and in-depth manner and made big strides forward. Our bilateral ties have taken on a sound momentum of development as evidenced by the great headway in such areas as political mutual trust, economic cooperation and trade, cultural and people-to-people exchanges and strategic coordination. The strategic implications of China-South Africa ties go far beyond the bilateral context and assume growing global influence. During this visit, State Councilor and Foreign Minister Wang Yi will have an in-depth exchange of views with South Africa on such major diplomatic agendas as President Xi Jinping's attendance at the BRICS Johannesburg Summit and President Ramaphosa's attendance at the 2018 Beijing Summit of the Forum on China-Africa Cooperation (FOCAC). China values its relations with South Africa. 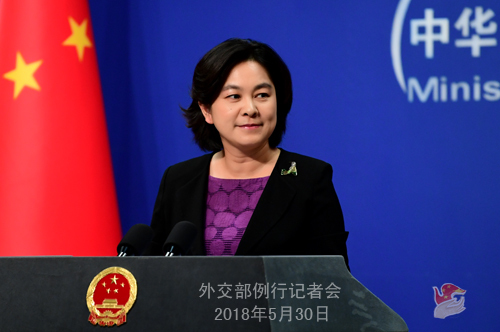 We are willing to deepen bilateral friendly cooperation across the board and elevate China-South Africa comprehensive strategic partnership to a new level by taking the commemoration of the 20th anniversary of the establishment of diplomatic ties as a new starting point and supporting each other in ensuring the success of the above-mentioned two important diplomatic events as a focal point. Last year, the BRICS Xiamen Summit was successfully held, which ushered in the second "golden decade" for BRICS cooperation. China will make all-out efforts to support and coordinate with South Africa, which holds the BRICS chairmanship for 2018 in ensuring the success of the 10th BRICS Summit to be held in Johannesburg in July. Indeed, the Meeting of the BRICS Ministers of Foreign Affairs is an important event which aims to lay the groundwork for the Johannesburg Summit. Foreign ministers from the five BRICS countries will have an in-depth exchange of views on the current international landscape, major international and regional hot-spot issues, BRICS practical cooperation and the preparations for the Johannesburg Summit. We believe that this Foreign Ministers' Meeting will achieve positive outcomes and make good political preparations for the Johannesburg Summit. Q: It is reported that the US Department of State has submitted the Hong Kong Policy Act Report to the Congress. What is your comment? A: Since the return of Hong Kong, the policies of "one country, two systems", "Hong Kong people governing Hong Kong" and a high degree of autonomy have been earnestly implemented. The Chinese government strictly abides by the Constitution and the Basic Law. We are resolute in implementing the policy of "one country, two systems" in a comprehensive and faithful manner and nothing will change it. I would like to point out in particular that Hong Kong is a special administrative region of China, and Hong Kong affairs belong to China's domestic affairs and brook no foreign interference. 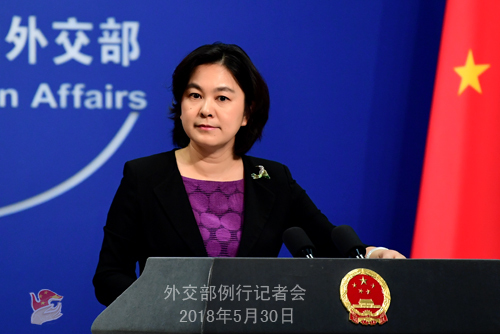 We are strongly dissatisfied with and firmly opposed to the US issuing the relevant report and making irresponsible remarks on Hong Kong affairs. We urge the US side to stop the relevant wrong move and speak and act with caution on Hong-Kong related issues. Follow-up: If the Hong Kong SAR government follows the directives of the central government on some issues, will it undermine the policy of "one country, two systems" and affect the international community's confidence in this policy? A: Who are you referring to when you mentioned the "international community"? Just as I said just now, since the return of Hong Kong, the policies of "one country, two systems", "Hong Kong people governing Hong Kong" and a high degree of autonomy have been earnestly implemented. The Chinese government strictly abides by the Constitution and the Basic Law and implements the policy of "one country, two systems" in a comprehensive and faithful manner. Q: Vice Chairman of the Central Committee of the Workers' Party of Korea (WPK) Kim Yong Chol recently got on Air China flight to head to New York. Can you confirm that he did transit Beijing and is flying to New York? Q: Reports say that there will be a meeting between China, Russia and the DPRK on the sidelines of the Shanghai Cooperation Organization (SCO) Summit in Qingdao. Can you confirm that? 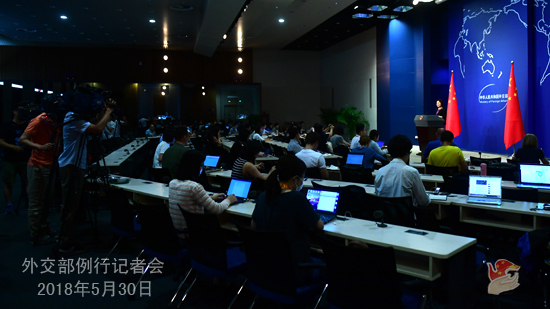 A: The Foreign Ministry already gave a briefing on the Shanghai Cooperation Organization (SCO) Summit in Qingdao to Chinese and foreign press on May 28. As to whether a meeting between China, Russia and the DPRK will take place on the sidelines of the summit, I have not heard about that. Q: What is your response to media reports that the US is planning to restrict the length of visas for Chinese graduate students in such fields as robotics, aviation and high-tech manufacturing to one year? A: We have noted relevant reports. As is known to all, people-to-people exchanges serve as an important basis for exchanges and cooperation in various fields between countries, including between China and the US. The facilitation of visa application is reciprocal and mutually beneficial and serves the common interests of our two peoples. We believe that both sides should take more proactive measures to further facilitate people-to-people exchanges and create more enabling conditions for across-the-board exchanges and cooperation between our two countries, instead of doing the opposite.